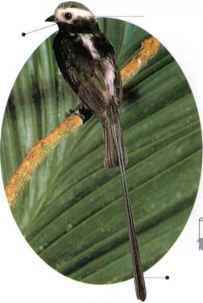 This squat, dark, short-billed bird occurs in forests on mountain slopes. 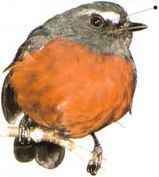 Slaty-backed Chat-Tyrants are often seen along streams. 'The species is highly sedentary - birds normally spend their whole life within a small locality. 'They are usually seen in pairs, hunting insects and other invertebrates in low vegetation. • NliST An open cup nest, built on a ledge on a rock face, near water. • Distribution Through the Andes from Venezuela to Bolivia, at altitudes where the climate is subtropical. 1 wo long tail feathers make this bird conspicuous in flight or in the prominent places where it tends to perch. It spends much of the day on an exposed vantage point in the tree canopy at the outer fringes of lowland rain forest or isolated woodlands. Favored perches are on dead or dying trees, bare branches, and snags. 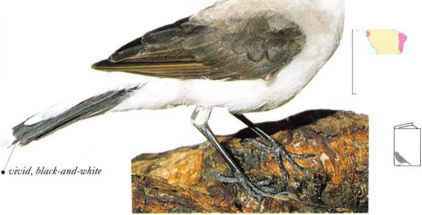 Long-tailed Flycatchers nearly always perch in pairs, and each pair tends to use a particular perch or series of perches habitually. They watch for flying insects and make quick outward flights to seize them, usually returning faithfully to the same perch. Stingless bees are among the most common prey items. • Nest A loose nest of plant materials is placed in a hole in a dead branch.